For other uses, see Feeder (disambiguation). Feeder playing a live gig under their side-project name of "Renegades" at the Electric Ballroom in Camden. Feeder are a British rock band based in Newport, Wales. Feeder has released eight studio albums, three compilations, two EPs, and 34 singles. As one of the few alternative rock bands from the 1990s to survive into the following two decades, they have eight UK Top 40 albums, including six UK Top 10 albums and three Top 5 albums. Three of their albums have been certified Gold by the British Phonographic Industry in their first week of release, for shipments of at least 100,000 units. Feeder's music has been inspired by a wide variety of artists and styles, including The Police, Nirvana, and The Smashing Pumpkins. On their debut release, the Two Colours EP (1995), their sound was radically changed from that of Raindancer, but Feeder has since introduced more acoustic aspects into their music, including elements of pianos and string orchestras. The band was formed in 1992 under the name of "Reel" by Grant Nicholas, Jon Lee, and Simon Blight of group Raindancer, after the other member of that group, guitarist John Canham, departed from it. However, Blight left Feeder in 1992 and was eventually replaced with Taka Hirose, after the band had used many session bassists from 1992–1995. After signing with The Echo Label in 1994, Feeder's lineup consisted of Grant Nicholas (guitar/vocals) and Jon Lee (drums), with them still using session bassists, who can be heard on early demos. In January 2002, Jon Lee took his own life in his Miami home, after which former Skunk Anansie drummer Mark Richardson began to record and play with the band, before being made an official member. In May 2009, he parted company with Feeder to return to a reformed Skunk Anansie. Since Mark's departure, Feeder have employed drummer Karl Brazil, although for sessions and touring commitments for Renegades (2010) they employed Australian Damon Wilson and former Mexicolas drummer Tim Trotter. Feeder garnered media attention in 2001 for their third album, Echo Park, and its lead single, "Buck Rogers", which later become a UK Top 5 single. In 2002, the band released their fourth album, Comfort in Sound, which was their first since the loss of their drummer, Jon Lee, earlier in the year. The album touched on themes such as loss and coming to terms with death, although it also explored themes of positivity. Comfort in Sound is Feeder's most successful release to date, selling over 503,706 copies in the United Kingdom between October 2002 and April 2012. Feeder would go on to become one of the UK's most successful rock bands, with a total of 166 weeks on the charts as of 2006, which also places them amongst the 500 most successful artists of the past 50 years at the time. After the campaign for their singles compilation was complete, the band dropped out of mainstream attention, while still charting three more Top 20 albums, with the latest being 2012's Generation Freakshow. Based on their certifications, the band have sold in excess of 1,360,000 records in the UK alone. At the age of 14, singer and guitarist Grant Nicholas joined a band called 'Sweet Leaf', named after a song by Black Sabbath, who were the first band he had seen play live. At this time Japanese bassist Taka Hirose and drummer Jon Lee were playing in different covers bands, but did not know each other. While playing in different bands on the Newport gig circuit, Grant and Jon became friends. They formed an electronic duo called 'Temper Temper' after Jon left Newport band The Darling Buds. Shortly thereafter, they formed a band called Raindancer. Both of these bands failed to win a recording contract, with the sound of the latter once being compared by Grant with that of The Waterboys. On 20 June 1991, Raindancer were invited to appear on Stage One, a late night television show on ITV Central, showcasing up and coming bands. The gig was filmed at The Town and Country Club, London without an audience present. Going back to the drawing board, Raindancer reformed as three-piece band called 'Reel' after John Canham departed. Their bass player Simon Blight later departed from the band and the music business, before changing their name to 'Real'. During this time in 1994 they recruited Taka Hirose via an advert in Loot, which Taka placed himself. The band then changed their name to Feeder, named after Grant's pet goldfish. They won their recording contract with Echo after sending a demo tape, and then completed the deal after an employee from the label witnessed one of the band's gigs. A track called "Don't Bring Me Down", which featured on the demo appeared as a b-side on the "Day In Day Out" single, albeit a different version to the demo recording. After signing with The Echo Label in 1994, the group toured with Scarborough band B.l.o.w. who at the time, recently formed from the ashes of Little Angels. It was this tour where Feeder met Mark Richardson for the first time. Feeder's first official release was a two-track EP entitled Two Colours, released in 1995 which was only available at the band's early gigs. It was limited to 1,500 CDs and 1,000 7" vinyls. In 1996, the band released their first commercially available release, being the EP Swim and received a 4/5 review in Kerrang! magazine (KKKK). Swim was later re-released in July 2001 with extra tracks, being a selection of b-sides from their earlier singles, alongside the videos for the Polythene singles "Crash" and "Cement". Overall unit sales for Swim stand at 40,000 as of February 2005. Shortly before the release of Swim, a cassette tape titled Two Tracker was given away free with the magazines Kerrang! and Edge and contained the tracks "Sweet 16" and "Waterfall". The latter was described on the inlay card, as one of the tracks that would be on their forthcoming debut album proper, with the working title Here in the Bubble (whose name was soon changed to Polythene). The photography for the inlay of Swim was produced by Grant himself, while Chris Sheldon produced the recordings. The band released "Stereo World" as a single after appearing at the Reading festival. "Waterfall" was rejected from the re-issue of Polythene which included their debut top 40 single "High". After building a strong fanbase with the release of Swim, the band released their first full-length album in 1997. The result Polythene, was one of the most critically acclaimed albums of 1997 with Metal Hammer and Kerrang!, placing the album at first and sixth in their respective end of year lists. Kerrang! later included the album in their 200 Albums For the Year 2000 list in the "Essential Britrock" category. Two tracks from Swim were used for the album, being "Descend" and "Stereoworld". After the recording sessions were completed, the album's first single "Tangerine" was released and charted at #60 in the UK singles chart. This was followed by "Cement", charting at #53 and then the release of the album which charted at #65. Two more singles were released before and after their main stage debut at the Reading festival, with "Crash" making number #48, while "High" charted at number #24. The album as of February 2005, has sold 89,000 copies. They also re-issued the album in October 1997, with "High" included and the "Stereo World" b-side "Change" replacing "Waterfall" from the original tracklist. Also included as an enhanced element was the video for "High". The album caused many critics to label the band "The UK's answer to the Smashing Pumpkins", and also draw comparisons to The Pixies and Talk Talk. In early 1998, following the band's final 1997 tour in support of Polythene, the band travelled to the United States as a support act for Everclear. During their U.S. tour, the band released a re-worked version of "Suffocate" for UK release, which charted at #37. After their return to the UK, they played their own headline tour with Everclear this time in the supporting position. Later that year, Feeder started to play various music festivals in the United States, alongside a headline tour with "High" being released to radio stations and charting at #24 on the Billboard Modern Rock Tracks chart; it was the follow-up to "Cement" which had charted at #31, also on the same listing. During the band's first U.S. tour, Grant broke his ankle and picked up other injuries, while finding it hard to sleep at nights. This inspired him to write "Insomnia", which later appeared on their second album. They stayed in the U.S. for the majority of the year, with a trip back to the UK for their V98 appearance. Feeder later included live-only guitarist Dean Tidey; Grant once said in an interview with Kerrang!, that he was considering bringing in another guitarist for their live gigs. For 1999's Yesterday Went Too Soon, the band decided to self-produce the album, brought in Matt Sime for engineering duties and had the album mixed in New York by Andy Wallace. "Dry" was re-recorded as a full band version after the original acoustic version appeared on "Suffocate" as a b-side. That single's b-sides featured tracks from the sessions for that album, therefore revealing what sort of direction it would take on. The working title for the album was originally A Life Through Headphones, and was originally set to be a double album. The name change was due to former Take That singer Robbie Williams releasing his solo debut album Life Thru a Lens, with the band not wanting to be compared to him. When the album was released, the band's reputation was on the rise and it entered the UK albums chart at number eight, which was at the time an unexpected chart position for the band. Before that, the band had released the album's first single, "Day In Day Out", in March 1999 which charted at #31 followed by "Insomnia" at #22, resulting in their first appearance on Top of the Pops. A week before the album's release, the band played the main stage of the Reading and Leeds festivals, while the title track from the album was at #20 in the singles chart. The album was then released on 30 August 1999. Only one single was lifted from the album after its release, in which a re-recorded version of "Paperfaces" charted at #41. Some of the album's lyrical themes were derived from Grant's personal perspective of working in a menial supermarket job on a daily basis ("Day in Day Out"), his experiences after gigs on their US tour ("Insomnia" and "You're My Evergreen"), past relationships (the title track and "Dry"), the music industry ("Hole in My Head") and "fear of commitment in relationships" ("Anaesthetic") amongst others. Musically, the album employed an indie rock feel to it, which also featured extended appearances of an acoustic guitar on some of its tracks. The album was due for release in June, but this was delayed until August to include material written after its completion which the band felt was too good to leave off. Upon its release, the UK music press immediately warmed to the album, which also received Melody Maker 's Album of the Week accolade. The year ended with the band providing support for the Red Hot Chili Peppers at Wembley Arena and Manic Street Preachers at the Millennium Stadium. As of March 2003, the album has been certified gold shipping 100,000 units in the UK, with total counter sales standing at 110,000 as of February 2005. The album was Melody Maker's #24 album of 1999, while Metal Hammer placed the album in at #6 and Kerrang! ranked it at #16. "Buck Rogers" was the band's first UK top 10 single, and is currently the joint highest peaking single from the band, tied at number five with "Tumble and Fall", released in 2005. Feeder spent most of 2000 at Great Linford Manor studios, writing and recording for their next album. The band also continued playing festivals around the country previewing the new material they were working on, such as V2000 and Glastonbury, but would end the year promoting "Buck Rogers", their first single since November 1999 and then playing a mini-tour at the end of the year to mainly showcase the new material. The release of the single on 8 January 2001 was coupled with a signing session at London's now defunct Tower Records store and then a TV appearance on Top of The Pops before the single charted. The single charted at number five, becoming the band's first top 10 entry in the singles chart before appearing on Top of the Pops again. "Buck Rogers" then spent a second week in the top 10. Grant wrote "Buck Rogers" with The Pixies as an influence, but "on a comic book level". He had originally written the track for another band Echo Park producer Gil Norton was working with, but decided not to give it away, as he felt Feeder could have a hit with it themselves. "Buck Rogers" still receives regular airplay on alternative radio stations in the United Kingdom. Kerrang! 's writers have also approved of the track as one of their "666 Songs You Must Own", when it appeared at #5 in their rock songs list in November 2004. After a sell-out tour of two legs ending at the London Astoria, the album Echo Park entered at number five in the UK album charts, shortly after "Seven Days in the Sun", the album's second single charted at #14. Shortly before the single's release, the band's rise up to the mainstream was recognised by the now defunct Scottish Television live music show Boxed Set, where a half-hour-long live-set with a studio audience was played. A third single, "Turn" reached #27 in July before festival season. "Just a Day", a b-side from "Seven Days in the Sun", later reached #12 in December. The response the album received on a critical level was mixed, with Dan Genroe of Q magazine claiming that the listener will still be "feeling hungry half an hour later", alongside suggesting that the album is "hard to love". Ben Myers of Kerrang! gave the album 4/5 (KKKK) which indicates "blinding", while citing that the band "hit their stride" on the album, alongside suggesting that the album is "fat free and stripped to the bone". The album saw the band take on much more of a commercially influenced sound, and also the appearance of Moog synthesizers, while being lyrically focused on a comedic approach, as with "Seven Days in the Sun", but also dark emotions, such as those shown on "Turn", "Oxygen", and "Satellite News". It was during the campaign for Echo Park that the band played another slot on the main stage at the Reading and Leeds festival, including T in the Park. As of August 2003, the album has shipped 300,000 units in the UK going platinum, with counter sales standing at 293,000 as of February 2005. Grant said in a Melody Maker interview that if the album did not sell well enough the band would probably split up; he said at the time that "It's the same with any band. That's just the way the music business is. There is only a certain amount of money a label will put into a band. I'm just being realistic. We've been around for seven or eight years and I am not planning on giving up, but we're putting everything into this record and I'm just hoping that people like it". The album campaign helped the band in August 2001 win the "Best British Live Act" accolade at the Kerrang! awards, before ending the year supporting the Stereophonics, and then releasing the "Just a Day" single in December. In February 2015, "Buck Rogers" gained a silver certification for 200,000 physical sales, digital downloads and streaming points combined. In January 2002, Jon Lee committed suicide in his Miami home, resulting in the band keeping out of the public eye for most of the year. It was during this time that lead-singer Grant Nicholas wrote a series of songs relating to their emotions and reactions to Jon's death, which formed their fourth album Comfort in Sound. The band brought in former Skunk Anansie and Little Angels member Mark Richardson for drumming duties. The album focused mainly on themes such as loss, depression, grief and positivity, while dedicating "Quickfade" to Jon. The album was released in October of the same year to widespread critical acclaim in the British music press, with Kerrang! alongside the heavy rock magazine Metal Hammer giving the album their respective Album of the Week accolades. The band were invited to the Reading and Leeds festivals that year, headlining the second stage at Reading on the first day which took place on 23 August, before heading off to Leeds the next. Grant also mentioned that at the time their fourth album already had a series of backing tracks recorded, with a total of 15 when recording is completed with then 10 chosen for the final album, when the final tracklisting was revealed, this was increased to 12. The album is currently Feeder's best-seller with an estimated 503,706 units sold as of April 2012. The album charted at #98 in Japan and #28 in Ireland, beating the peak position of #57 that Echo Park managed during the previous year. In Japan, it would be the first time Feeder ever charted there. The album charted at number six in the UK. Musically, the album was much more mellow, with the use of a string orchestra on "Forget About Tomorrow", while other tracks on the album also used an accordion, trumpet, and a piano played by their manager Matt Page, with "Godzilla" being one of two tracks on the album to use loud guitars. The album was their first release to be certified platinum, (with Echo Park going platinum later on). It also spawned their second top 10 single, with "Just the Way I'm Feeling" in January 2003. In December of the same year they took on their only arena tour, after the album's first nationwide tour was a sell out with 50,000 tickets sold, and visited 21 different towns and cities in the United Kingdom over 23 different dates. In reaction to this, the band were invited to the Glastonbury Festival being placed third on the last day, playing the "Pyramid Stage". Shortly after the release of the single, the band were invited to support Coldplay on their UK and European tour, due to their frontman Chris Martin often saying how much he liked the Comfort in Sound album and their live shows. Their show at the Birmingham National Indoor Arena was reviewed by Kerrang!, which seen Steve Beebee give the band 4/5 (KKKK) for their performance. The album's final single, being the title track, was only available to buy as a limited edition of 3,000 CDs on their 2003 arena tour. Four singles were released commercially, with those being "Come Back Around" (#14), "Just the Way I'm Feeling" (#10), "Forget About Tomorrow" (#12), and "Find the Colour" (#24), which was released following their V2003 appearance and Kerrang! award win for "Best British Band", beating competition from Muse and the Stereophonics, which Grant dedicated to Jon saying it was the award he had always wanted the band to win. The band later went on to win an Internet Music Award for their "Just The Way I'm Feeling" video, while the album became their first to appear on the end of year top 75 album charts, appearing at #66. The albums commercial reception, helped Echo experience their most successful financial year. Feeder then received their only nomination to date at The BRIT Awards, in which they appeared in the "Best British Rock" category at the 2004 event, before making their only appearance in the charts that year as part of Bob Geldof's Band Aid 20 charity ensemble. The single was the Christmas number one, and became the year's biggest-selling UK single. Alongside only making one chart appearance in 2004, Feeder also only made one live appearance during the year as part of the Carling Live 24 event, playing their show at the Hammersmith Apollo on 1 May. Feeder returned to the studio to record their fifth album Pushing the Senses. The album was seen by Grant as more of an extension to Comfort in Sound, as it focused on the same lyrical themes and musical styles, and also said that it had more of an organic sound, with more upbeat tracks added into the mix. It also seen a number of piano driven tracks, with "Frequency" being an example. "Frequency" was produced by Coldplay producer Ken Nelson, while for the rest of the album, Gil Norton was on production duties. Grant told Kerrang! in May 2004, "I've done some recording on my own in a little studio up by where I live in North London. I demo the album in its full form before the rest of the band play on it. Its difficult to know at this stage what it will turn out like, but so far its slightly more mature sounding". Grant later added "Each album is a journey and a reflection of the past, there is some stuff that touches on what has happened, but there are songs about love, songs of loss and songs about the future. I don't want to give too much away but there's one track called "Bitter Glass". Its quite dark but uplifting too. Its about pulling yourself out of a big hole". The album was Feeder's highest charting release, at number two on the UK album chart selling 42,951 units in its first week, while receiving a gold certification, and becoming a top 100 album in six other countries. Press response to the album was mixed. Kerrang! were brutal towards the band for all of their review, with Ben Meyers referring to them as a "Radio Friendly Unit Shifter", including comparisons to a "Pastel box". Grant later said in a documentary with Kerrang! Radio that he was "pissed off" with the review their magazine counterpart gave them, while citing "It was a very unfair review and reviewed by the wrong person". The album helped them win their only major headline slot to date, being at 2005's Download Festival, shortly before supporting U2 for a brief period on their Vertigo Tour, which was followed by an appearance at the Live 8 concert in Edinburgh (the second charity event the band played that year after Tsunami Relief Cardiff). The campaign in total spawned four UK top 40 singles, which included "Shatter", a reworked version of the "Tumble and Fall" b-side that became a double A-side with "Tender" (#11). Other singles included "Tumble and Fall" (top five), "Feeling A Moment" (#13), and "Pushing the Senses" (#30). A fan-petition had been launched to see "Shatter" released as a single in its own right. The album was after ten weeks on sales of 111,214 units, 22 percent ahead of Comfort in Sound at that stage. However, the album did not keep up this momentum while also not going platinum. The last reported sales were that of 160,183 in October of the same year, which fell below Echo's expectations. It is however the bands most successful record based on peak chart positions in each country of release, while also being their only album so far to spawn a charting single outside of the UK and Ireland when "Feeling a Moment" peaked at #32 in Australia. Feeder already at the time charted four top 50 singles in Ireland, with "Tumble and Fall" being their first and only top 40 to date reaching a peak position of #26. The album itself made the Irish top 20 artist album chart at #16, one week before its UK release. Feeder would end the year seeing their then latest album appear at #39 on Q's end of year list, with "Feeling a Moment" voted the 98th best song of the year by its readers. However, on 3 December 2005, they were forced to postpone a winter tour, after Grant picked up bleeds on his vocal cords the night before during a gig in Brighton, causing the show to be abandoned and later rescheduled along with the rest of the outstanding dates. During the year, Feeder's domestic studio album sales passed the one million units mark. In late 2005, Feeder already returned to the studio, with Stephen Street working as the band's producer to record three new tracks to appear on their then forthcoming singles collection. "Lost and Found" (which Grant described as "an urban love song") became the first single to promote the collection, and would reach #12 in the UK singles chart in May 2006, after completing their delayed winter tour, which ended at the LG Arena in Birmingham in front of 8,000 fans. The Singles, released in the same month as "Lost and Found", was the first Feeder album to have involvement from a major label, with EMI taking part in a one-off collaboration with Echo as the album's distributor. The album reached number two on the UK albums chart with first week sales of 50,003 entering at number three, and was certified platinum in under three months, with a total of 497,700 units sold as of April 2012, including a gold certification in Ireland after charting at #13. The album also made the top ten in Europe with a debut top 40 peak in Japan at #37, while "Save Us" was its second and final single in the UK, charting at #34 in late July. A version of the album included a DVD of all their videos filmed up to that point, along with extensive sleevenotes by Ben Johncock. The album became only their second to appear on the end of year top 75 this time at #48, while becoming their first album to spend more than one week on the top 10. Sales of The Singles, alongside a series of changes at Echo making them into an "Incubator label", enabled the company to report a "modest profit" for 2006. Feeder returned to the Reading and Leeds festivals after a four-year break, having a late slot on the main stage, before ending the year with a small tour of London, playing The Roundhouse, and The Coronet. These were in aid of War Child who the band are patrons of, having earlier in the year visited The Congo as part of their work for the charity. "Miss You" was a free download track from Silent Cry. In 2007 Feeder returned to the studio to record their sixth album. Most of the year was spent on the recording, and in 2006 the band announced in an interview with XFM that the album would be reminiscent of their earlier material. The resulting album Silent Cry was released on 16 June 2008. The album overally received moderate reviews. While some like Guardian were negative towards the album. others like Rock Louder were more positive. On its release week the album charted at number eight with sales of 16,029. In its second week the album then fell to number 30, with a third week drop to number 60 before leaving the top 75 albums listing. In Japan it peaked at #53 which is currently higher than all their studio albums, but lower than the peak of The Singles. Before the release of the album, "We Are the People" charted at #25 in the singles chart, making it their lowest chart position for a lead single since 1999's "Day in Day Out". "Miss You" from the album was given away by the bands official website as a free download in April, and gained over 8,000 downloads on its first day of release. As of December 2008, sales of Silent Cry stand at less than 50,000 units, less than was what hoped for by their label. Shortly after album release, the band recorded a cover of Public Image Ltd's 1978 self-titled single "Public Image", for a compilation album to celebrate Independents Day which celebrated independently released music. The second single from Silent Cry was Feeder's first download-only single, consisting of "Tracing Lines" and the album's title track which failed to make the charts. In May 2008, the band played a small eight date tour to promote the album to the fanbase, which sold out in six hours. This was followed by a one-off gig on 12 June at the Proud Galleries in Camden, which sold out in six minutes. The band then went on to play at the iTunes festival in July, which saw a live six-track EP release of their performance, before playing the 2008 Reading and Leeds festivals in August, on the main stage. In July the band played at T in the Park, with an appearance at the Isle of Wight Festival the month previous. In 2008, the band also introduced live keyboard player Dean Deavall, of the band Casino. During the same year, on 25 October at 06:00 GMT after playing the Glasgow Barrowlands as part of their 29 date UK tour, the band's crew bus caught fire on the M62 motorway whilst travelling between Glasgow and Lincoln, destroying it and the crew's personal items. It was also announced by Chrysalis later on in the year, that Echo have been restructured into a copyright exploitation company, in which its main duty is maintaining the copyright on existing releases while no longer releasing any new records or signing any more artists. As a result, Feeder were until 2010 no longer on a record contract in their own country, while still being signed to their Japanese label Victor and Play it Again Sam (PIAS), their European label. Their 2008 UK tour, seen their first ever gig in Loughbrough, and their last ever show at the London Astoria on 18 November 2008. The venue was later torn down in early 2009 and was also their last ever show as an Echo Label artist. After ending their tour at the Portsmouth Pyramids Centre, a six track EP titled Seven Sleepers was released in Japan, the same time they toured there in March. It included a collection of B-sides from the Silent Cry album, plus two new songs. After starting 2009 with two warm-up shows for their tour of Japan in Scarborough and Crewe, the band later on in May announced that Feeder had "ended their partnership" with drummer Mark Richardson, who returned to his original band Skunk Anansie. Mark was replaced by session drummer Karl Brazil who had just come off tour with James Blunt, and had also played drums for British band Ben's Brother. Karl's first live appearances with the band, after a series of university events were at the UK leg of the Sonisphere Festival, stating that this would be their only UK festival appearance of 2009, as they would be working on their seventh studio album. It was then later announced that they would be appearing at the Hevy Music Festival in Folkestone. Here they previewed a new track titled "Sentimental", with the announcement that they have been in a recording studio in South Wales. At first, Tim Trotter then of Mexicolas was filling in on drum duties in the studio also as a session drummer, before Karl stepped in. With Karl playing drums for Robbie Williams, Natalie Imbruglia and Ben's Brother, Tim once again took over drum duties in the studio. On 2 December, the band's official webpage was changed to display the word "RENEGADES" and the names of each of the band members by their surname, with "BRAZIL" mentioned amongst these. On 17 December a sample of a new song "Sentimental" was added to their website, which was later replaced with a 20-second clip of another song called "Renegades". Later on that month the website announced a six date tour and the release of a tour-only EP which was released on "Big Teeth Music", also their own record label. After the tour was completed, another six date tour was shortly announced with the band this time playing bigger venues. Another EP was released to coincide with the tour, which included a further four new songs with one of these being titled "Home"; one of the new songs the band performed on their first tour under this alias. The side-project was used as a method to promote the seventh Feeder studio album titled Renegades at live shows where they would mainly play the new songs, thus avoiding having to play any of their hits if they played as Feeder. The side-project would cease in 2010 after playing their final gig as Renegades at that year's Sonisphere Festival. In an April 2010 interview with South Yorkshire newspaper The Star, Grant expressed his disappointment with the side-project band's sudden increase in success and awareness, in which he claimed that he wanted the band to continue playing in clubs with a slower ascendency to the bigger venues. The tour promoter however suggested that Renegades should play slightly bigger venues for the second tour than of those seen on their debut. Looking back on this version of the band, Grant Nicholas explained in an interview with Culture Deluxe, that the project was not a big marketing plan, but announced it without saying exactly what was happening. Some people thought it was a name change, Grant recording a solo album, while others got the idea from the start. He described problems with promoters printing "Feeder" on the tickets, leading to a misunderstanding that a more mainstream set was expected. After a tour of Japan which saw Luna Sea guitarist Inoran join them on stage at the Daikanyama Unit for a performance of "Breed" (originally recorded by Nirvana), Feeder returned to the UK for a sell-out tour in late October which started at the Leeds Metropolitan University, before ending at Southampton University. This was followed by a small tour of Europe, South Africa and Australia, before a brief return to the UK ended their year. "Down to the River / This Town" also became the final single from the album, released only as a download and vinyl on 6 December. In 2010, during the Renegades sessions, a number of tracks were left off the album before then being considered for inclusion for the follow-up to that album. As there were not enough to fit on the album, more were recorded during the closing stages of the year, with the band taking a break from recording on 19 December, before resuming recording on 10 January 2011. Between 16 January and 24 January a production session began in New York City, this included overdubs, guitars and keyboards with Grant also flying over to record vocals, while some of the album was already recorded in London. On 19 January 2011 a photo of song lyrics written on a sheet of paper was posted on their official Facebook page. The first of these songs to enter public knowledge, with different working titles was "Borders", with other working titles being "Jessie" and "White City Rock". In an interview with Heineken Music, on 27 January 2011 Grant revealed that 19 or 20 songs are so far in the recording stages, while the album is planned to be released after their tour of the United Kingdom and Europe ends in March, and like Renegades, looks likely to be released domestically on their own Big Teeth Music imprint. "Side By Side", which was a chart-eligible paid download in aid of the victims of the 2011 Tōhoku earthquake and tsunami in Japan, charted at #91, before it ultimately did not appear on the UK version of the album, although did appear on the Japanese release. Grant Nicholas cited on the band's Facebook page, that the single was released purely for the Japanese Tsunami disaster with the chart position not being as important. During their 2011 touring, Feeder introduced drummer Damon Wilson as a live regular and session musician. In September 2011, the band revealed on their Facebook page that the recording of their yet-untitled eighth studio album is complete with only mixing on the final song to be finalised, before mastering then began on 30 September in New York. Feeder hosted a trailer on YouTube titled "Coming Soon" on 2 December 2011 and had a message written in Morse code as "-... --- .-. -.. . .-. ...", which translates to "Borders". On 6 December 2011 another trailer was released, announcing "Borders" as the first single from the new album, including a four-date tour. On 19 January 2012 the official music video for "Borders" was uploaded on YouTube. "Borders" was released on CD, cassette and 7" on 30 January 2012, with the parent album Generation Freakshow originally scheduled with a release date of 26 March 2012 but later delayed until 23 April 2012. This was the first time Feeder released a cassette single since 2001's "Just a Day". In February 2012 after Feeder had completed a mini-tour, which ended in Inverness and started in Exeter, "Borders" charted at #52 giving the band their 25th top 75 single and their first official chart visit since 2008's "We Are the People". Critical response, much like the previous few Feeder albums, was mixed. BBC Music praised the album, while Drowned in Sound, despite negative reviews in the past, credited Feeder for creating another strong addition to their back catalogue. The album which was released to coincide with a week-long tour, however improved upon the respectable commercial response of Renegades by charting at #13, which increased the band's UK album charts span to fifteen years, while selling 7,338 units in the same week. In Japan, Generation Freakshow improved upon the relatively disappointing chart position of Renegades, when it entered at #57 and became their most successful studio album in almost four years. The only track from the sessions of the Renegades album to end up on Generation Freakshow, was that of "Tiny Minds". The week following the album's release, "Children of the Sun" was released as the album's second single and saw the band revert to the vinyl and download formats. Because of this, the single failed to chart while not attracting the same radio attention as "Borders". The title track was due to be a single, but was later pulled despite promotional CDs already being pressed and sent to radio. "Idaho" became the third single from the album, released on 27 August 2012. Like "Children of the Sun", this also failed to chart. The band continued their year with a main stage appearance at the Isle of Wright Festival, opening the event. This was then followed by a first appearance in four years at the Reading Festival, although in their lowest position since their 1996 debut, headlining the fourth stage. Their appearance at the T in the Park festival that year was later cancelled, due to a band illness. It was announced in July that "Idaho" will be the third single from Generation Freakshow, and will be released on 27 August. The band played at Hyde Park in August as part of a series of concerts to celebrate the 2012 Summer Olympics, which was preceded by an appearance at Lusty Glaze in Newquay, alongside performances in Wales and Ireland, with the video shoot for "Idaho" in between. Later on in 2012, Feeder took on one last tour for the year. The tour lasted for five dates starting at the O2 Academy Glasgow, before ending at the Brixton Academy in November. At the Brixton show, Grant Nicholas announced that the band would be going away for a while, before deciding what to do next. Earlier on before the tour began, Nicholas was interviewed by website Mancunian Matters in which he told them that the band would take a break next year with no shows planned, although a follow-up album was mentioned alongside possible side-projects. Although 2013 was their first full year on hiatus, they played one show that year at Reading University as a private event, while no other shows were played. Their back catalog which was initially issued on The Echo Label, was later re-issued by Sony Music Entertainment, thus allowing the distribution of this material to continue. During 2013, Hirose's side-project band Muddy Apes released their second album in Japan, which also features Tidey. Later, on 3 March 2014, Nicholas announced a solo project via the launch of a Twitter handle and Facebook page, while an official website is to be launched. On 31 May 2014, Grant's debut solo recording "Soul Mates", was played on BBC Radio 2, with the release of his album Yorktown Heights on 9 August 2014 in Japan and 11 August 2014 in the United Kingdom. Shortly after the download release of "Soul Mates", Grant later posted a handwritten note on Facebook announcing the release date of his solo album, while also revealing "Feeder's heart still beats strong" and has been working on new material with Taka. In a 2008 interview with Kerrang! on a selection of the band's singles, Nicholas expressed his annoyance with comparisons between Coldplay and the album Pushing the Senses; he said that those comparisons were only made because he played a piano on many of the tracks that were on the album. In a 2011 interview with Cambridge-based webzine The Tab, he elaborated on his position regarding these comparisons, saying, "Feeder have a much broader music dynamic musically, and we are a much heavier band, both live and on record. I have a lot of respect for Coldplay and we have toured with them, but we are two totally different bands, both dynamically and musically. I just think it's lazy journalism." Over the course of their career, Feeder has come to domestically accumulate a total of eight gold and platinum records, with a gold record in Ireland for The Singles, bringing their worldwide total to nine. In 2015, "Buck Rogers" received a Silver award for 200,000 UK sales, just 14 years after release. Despite having completely dropped out of the mainstream for six years after the platinum-selling singles compilation, (which peaked at #2 on the UK Top 75 albums chart) and the band being relegated almost solely to alternative rock stations in the United Kingdom, Silent Cry reached #8 on the albums chart in its first week of release in 2008 with 16,000 units sold. It has sold less than 50,000 units to date according to Chrysalis, the owners of the now defunct Echo Label. The subsequent Silent Cry tour was Feeder's longest playing up to 29 different dates, with many selling out. Nevertheless, Silent Cry remains their first album since 1997's Polythene not to achieve at least gold status. The 2010 follow-up Renegades, was less successful only spending two weeks in the chart after entering at #16, while also being their first since the aforementioned Polythene not to chart within the Top 10. However, the charting of Rengades, marked the third decade in which a Feeder album had been released and charted at least in the Top 20. This marked their 6th studio album to appear in the Top 20 and the band's 9th album to appear on the chart regardless of position over the course of their career. The album also debuted at #1 on the Official UK Rock Albums chart. Still, Renegades has yet to accumulate sales that approach or eclipse any of their other studio albums before this. 2012 follow-up Generation Freakshow, charted higher at #13 although on lower debut week sales. 2002's Comfort in Sound is the band's best selling release, shifting over 503,706 units in the United Kingdom alone with The Singles taking second spot with 497,700 units. At the end of 2006, when the campaign for The Singles was drawing to a close, Feeder ranked as one of the UK's most successful chart acts of the past 50 years, with a total of 166 weeks across both charts without reaching the number one spot. In Japan, Feeder have also gained a cult following, in which their last five studio albums have all charted in the top 100 between 2002 and 2012. Their most successful of these is 2008's Silent Cry charting at #53, although their most successful and only top 40 entry to date is their 2006 singles compilation, meaning the band have charted six albums regardless of format. In addition, much of their music has been featured in the Gran Turismo racing video game series, which is developed by the Japanese video game development studio Polyphony Digital. Feeder are also one of Wales' most popular rock bands, highlighted in October 2003, by the display of Taka's bass guitar from the "Seven Days in the Sun" video at the Hard Rock Cafe in Cardiff and Grant's attendance at the branch's opening the same year. The Cardiff branch later closed in late 2010, one day shy of its seventh anniversary of opening. Feeder have headlined many of the United Kingdom's major venues, such as Wembley Arena, Birmingham National Indoor Arena, Birmingham LG Arena, Bournemouth International Centre and the Cardiff International Arena. Alongside this, Feeder also headlined a major festival for the first (and currently only) time in their career, which was at the 2005 Download festival. In an April 2012 interview with British rock monthly Total Guitar, the band were praised by Rob Laing citing "All the way from their very first release, the Two Colours EP in 1995, through tragedy and triumph, he's [Grant] gone the distance with Feeder while other British alternative rock bands of the 90s crashed or faded". ↑ 1.0 1.1 1.2 1.3 Jon Lee tribute night at T. J. 's Newport, programme guide. ↑ "Memories of Jon Lee". Nick Brown Online. Retrieved 29 May 2013. ↑ 3.0 3.1 3.2 3.3 3.4 3.5 3.6 "Descend FAQ". Descend. Archived from the original on 14 October 2007. Retrieved 15 March 2007. ↑ "Raindancer - Live (3 Track Video)". feederanorak.co.uk. Retrieved 20 August 2012. ↑ "Taka Hirose interview- February 2007". brent.gov.uk. Retrieved 25 March 2007. ↑ "Day in Day Out", Feeder Central Exclusive CD single inlay inserts. ↑ "Feeder Interview - 9 September 2005". SoundsXP.com. Retrieved 19 April 2011. ↑ "Two Colours CD". feederanorak.co.uk. Retrieved 31 August 2009. ↑ "Two Colours 7". feederanorak.co.uk. Retrieved 1 March 2007. ↑ "Kerrang! "Swim" review". feederscrapbook.co.uk. Retrieved 1 March 2007. ↑ ""Two Tracker" info page". feederanorak.co.uk. Retrieved 29 July 2007. ↑ 14.0 14.1 14.2 14.3 "Band Biography- Feederweb.com". feederweb.com. Archived from the original on 30 May 2006. Retrieved 31 July 2007. ↑ 15.0 15.1 "Metal Hammer yearly albums lists". rocklist.net. Retrieved 2 March 2007. ↑ 16.0 16.1 "Kerrang! yearly albums lists". rocklist.net. Retrieved 6 February 2007. ↑ "Kerrang! lists". rocklistmusic.co.uk. Retrieved 25 November 2011. ↑ 18.00 18.01 18.02 18.03 18.04 18.05 18.06 18.07 18.08 18.09 18.10 18.11 18.12 18.13 18.14 18.15 18.16 18.17 18.18 18.19 18.20 18.21 18.22 "Chart Stats - UK Singles & Albums Chart Archive - Feeder". ChartStats.com. Retrieved 2 November 2007. ↑ ""The Empire Strikes Back! "- Kerrang! article". feederscrapbook.co.uk. Retrieved 31 March 2007. ↑ "Festival info- Feeder". isleofwightfestival.com. Archived from the original on 6 May 2008. Retrieved 12 October 2008. ↑ 21.0 21.1 ""Feeder Live Treat- They'll Play New Songs For Brit Fans"- Kerrang! article". feederscrapbook.co.uk. Retrieved 31 July 2007. ↑ "US artist chart history". billboard.com. Retrieved 1 March 2007. ↑ ""Feeder Star Injured Again"- Kerrang! article". feederscrapbook.co.uk. Retrieved 31 July 2007. ↑ ""Feeder Star Injured in US"- Kerrang! article". feederscrapbook.co.uk. Retrieved 31 July 2007. ↑ 25.0 25.1 "Kerrang! News". feederscrapbook.co.uk. Retrieved 3 August 2007. ↑ "Kerrang! Liverpool Lomax gig review". feederscrapbook.co.uk. Retrieved 8 August 2007. ↑ 27.0 27.1 ""A Life Through Headphones finished"- Kerrang! article". feederscrapbook.co.uk. Retrieved 31 July 2007. ↑ ""Yesterday Went Too Soon Lowdown"- Kerrang! article". feederscrapbook.co.uk. Retrieved 3 August 2007. ↑ Feeder Central "Suffocate" release information mailing card. ↑ ""The Great American Dream"- Metal Hammer article". feederscrapbook.co.uk. Retrieved 31 July 2007. ↑ ""Feeder In Robbie Williams Clash"- Kerrang! article". feederscrapbook.co.uk. Retrieved 3 August 2007. ↑ ""Maker Shakers"- Melody Maker article". feederscrapbook.co.uk. Retrieved 21 January 2009. ↑ 33.0 33.1 33.2 Pete Seaton and Richard Down. (2006). The Kaleidoscope British Television Music & Variety Guide II: Top Pop 1964 - 2006. Kaleidoscope Publishing. ISBN 978-1-900203-27-2. ↑ ""Life Thru a Lens" part 1- Kerrang!- 31 August 1999". feederscrapbook.co.uk. Retrieved 14 March 2007. ↑ ""Life Thru a Lens" part 2- Kerrang!- 31 August 1999". feederscrapbook.co.uk. Retrieved 14 March 2007. ↑ ""Yesterday Went Too Soon" info page". amazon.co.uk. Retrieved 30 March 2007. ↑ Feeder Central "Insomnia" mailing list release information mailing card. ↑ 38.0 38.1 "Press Advert: Yesterday Went Too Soon Tour & Album". feederscrapbook.co.uk. Retrieved 16 February 2008. ↑ ""Yesterday Went Too Soon" reviews- August 1999". feederscrapbook.co.uk. Retrieved 29 March 2007. ↑ 40.0 40.1 40.2 40.3 40.4 "Searchable UK certifications database". bpi.co.uk. Retrieved 10 September 2009. ↑ "Melody Maker yearly albums lists". rocklist.net. Retrieved 6 February 2007. ↑ "Buck Rogers" stats". chartstats.com. Retrieved 15 January 2009. ↑ "Rock Sound: The Seven Year Itch". feederscrapbook.co.uk. Retrieved 11 October 2008. ↑ "Top 10 stations that play Buck Rogers". comparemyradio.com. Retrieved 6 May 2010. ↑ "Kerrang's "666 Songs You Must Own"". rocklistmusic.co.uk. Retrieved 18 July 2007. ↑ 47.0 47.1 "Q- "Echo Park" review". feederscrapbook.co.uk. Retrieved 12 October 2008. ↑ 48.0 48.1 "Kerrang!- "Echo Park" review". feederscrapbook.co.uk. Retrieved 12 October 2008. ↑ 49.0 49.1 ""Straight Down The Line"- Melody Maker interview- 25 July 2000". feederscrapbook.co.uk. Retrieved 30 March 2007. ↑ "Kerrang! awards 2001 report- 28 August 2001". bbc.co.uk. 28 August 2001. Retrieved 1 March 2007. ↑ "Grant Nicholas and Mark Richardson interview". music-news.com. Retrieved 11 October 2008. 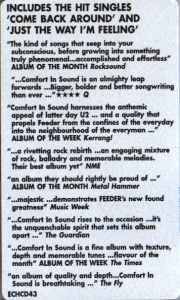 ↑ "Amazon.co.uk "Comfort In Sound" info page". amazon.co.uk. Retrieved 5 March 2007. ↑ ""Comfort In Sound" album sticker". feederanorak.co.uk. Archived from the original on 30 June 2007. Retrieved 1 March 2007. ↑ The Evening Session BBC Radio 1 interview. April 2002. ↑ 55.0 55.1 55.2 55.3 55.4 "Official Charts Analysis: Jack White revives albums market with 40k sales". Music Week. Retrieved 30 April 2012. ↑ 56.0 56.1 56.2 56.3 56.4 56.5 "フィーダー (In Japanese)". oricon.com. Retrieved 31 August 2009. ↑ 57.0 57.1 57.2 57.3 57.4 "Irish Music Charts Archive". Chart Track. Retrieved 28 October 2007. ↑ ""Comfort in Sound" - Import Super-Audio CD info page". cduniverse.com. Retrieved 30 March 2007. ↑ "EMI Chrysalis News Archive article- August 2003". chrysalis.com. Retrieved 1 March 2007. ↑ "Feeder Instore Gig This Monday". tourdates.co.uk. Retrieved 10 August 2010. ↑ "Glastonbury 2003 Sunday Line-up". bbc.co.uk. Retrieved 6 May 2007. ↑ "Kerrang! Birmingham National Indoor Arena review, 8 December 2003". feederscrapbook.co.uk. Retrieved 5 December 2010. ↑ "Feeder Release New Single Online". tourdates.co.uk. Retrieved 6 November 2007. ↑ "Kerrang! awards 2003 report- 22 August 2003". bbc.co.uk. 22 August 2003. Retrieved 1 March 2007. ↑ "Kerrang: Best British Act- 21 August 2003". feederscapbook.co.uk. Retrieved 16 February 2008. ↑ "Awards honour interactive music". BBC.co.uk. 2 December 2003. Retrieved 2 September 2007. ↑ "Year-End Charts 2003" (PDF). ChartsPlus.com. Retrieved 3 January 2009. ↑ "Chrysalis Group PLC Annual Report and Accounts 2003" (PDF). Chrysalis.com. Retrieved 18 January 2009. ↑ "Band Aid 20". Band Aid 20.com. Retrieved 11 October 2008. ↑ "Year-End Charts 2004" (PDF). ChartsPlus. Retrieved 11 October 2008. ↑ "Grant on "Pushing The Senses"". feederweb.com. Archived from the original on 14 October 2007. Retrieved 14 March 2007. ↑ Pushing the Senses inlay booklet. ↑ "FEEDER - PUSHING THE SENSES (ALBUM)". dutchcharts.com. Retrieved 28 October 2007. ↑ ""Pushing The Senses" reviews". metacritic.com. Retrieved 14 March 2007. ↑ "Kerrang: Pushing The Senses Review". feedescrapbook.co.uk. Retrieved 26 February 2009. ↑ Kerrang! Radio- "Feeder Uncovered" documentary. August 2005. ↑ "Download Festival 2005 / LINE UP". Download Festival website. Retrieved 21 February 2007. ↑ ""Shatter" review". bbc.co.uk. Archived from the original on 28 January 2006. Retrieved 14 March 2007. ↑ "2005 Business Report" (PDF). chrysalis.com. Retrieved 18 January 2009. ↑ Kent, David (2006). Australian Chart Book 1993 - 2005. St Ives, N.S.W. ISBN 0-646-45889-2. ↑ 84.0 84.1 "Q Magazine's albums and tracks of 2005 lists". Rocklist.net. Retrieved 7 March 2007. ↑ "Feeder reschedule cancelled dates - Grant Nicolas recovering after damaging his vocal chords". tourdates.co.uk. Retrieved 1 April 2011. ↑ "Chrysalis 2006 business report" (PDF). chrysalis.com. Retrieved 29 March 2007. ↑ ""The Singles" stats". ChartStats.com. Retrieved 2 November 2007. ↑ "Gold Certifications database". irishcharts.ie. Retrieved 20 May 2007. ↑ "ARIA report, issue 848" (PDF). ARIA. Retrieved 7 September 2008. ↑ "Year-End Charts 2006" (PDF). ChartsPlus.com. Retrieved 3 January 2009. ↑ ""The Singles" chart stats". ChartStats.com. Retrieved 31 January 2009. ↑ "Chrysalis Group PLC Annual Report and Accounts 2006" (PDF). chrysalis.com. Retrieved 19 January 2009. ↑ ""The Dead Zone"- Q Magazine report- 15 September 2006". feederscrapbook.co.uk. Retrieved 29 March 2007. ↑ "X-clusive: Feeder On New Album And Charity Gig- September 2006 interview". xfm.co.uk. Retrieved 1 March 2007. ↑ "Feeder "Silent Cry" review". drownedinsound.com. Retrieved 19 July 2010. ↑ "Kerrang! "Silent Cry" review". feederscrapbook.co.uk. Retrieved 9 December 2010. ↑ Sullivan, Caroline (18 July 2008). "Feeder "Silent Cry" review". guardian.co.uk (London). Retrieved 19 July 2010. ↑ "Q "Silent Cry" review". feederscrapbook.co.uk. Retrieved 21 July 2010. ↑ "Feeder "Silent Cry" review". musicomh.com. Retrieved 19 July 2010. ↑ "Feeder "Silent Cry" review". rocklouder.co.uk. Retrieved 6 September 2008. ↑ 104.0 104.1 ""Silent Cry" stats". chartstats.com. Retrieved 1 September 2008. ↑ 105.0 105.1 Music Week. 11 July 2010 United Business Media. ↑ "Feeder! Feeder! Feeder!". Ground Level. Retrieved 28 April 2008. ↑ 107.0 107.1 "2008 Preliminary Results" (PDF). Chrysalis.com. Retrieved 18 January 2009. ↑ "Independents Day 08". independentsday08.com. Retrieved 6 September 2009. ↑ "Your band could support Feeder". icwales. Retrieved 24 April 2008. ↑ "WIN VIP TICKETS TO SEE FEEDER AT THE PROUD GALLERIES". feederweb microsite. Archived from the original on 31 July 2008. Retrieved 28 April 2009. ↑ "Touring commences". Feederweb.com. Retrieved 6 September 2009. ↑ "Feeder interview". Crackerjack. 30 August 2008. Retrieved 16 August 2010. ↑ "Rock band Feeder's crew bus bursts into flames on M62 in Calderdale - see the dramatic picture". Halifax Courier. 28 August 2008. Retrieved 16 August 2010. ↑ "Feeder FAQ". feederfaq.co.uk. Retrieved 12 July 2009. ↑ 115.0 115.1 "News". KarlBrazil.com. Retrieved 3 June 2009. ↑ 116.0 116.1 "NEW SUMMER SHOWS ANNOUNCED". Feederweb.com. Archived from the original on 3 August 2008. Retrieved 15 April 2009. ↑ "Feeder Return! - Xfm". XFM.co.uk. Retrieved 5 January 2010. ↑ "Renegades Make Good their Escape". Herald Scotland. Retrieved 7 May 2010. ↑ 120.0 120.1 "Renegades star Grant Nicholas faces echo from the past". The Star. Retrieved 12 April 2010. ↑ "Culture Deluxe Interview: Feeder". Culturedeluxe. Retrieved 9 December 2010. ↑ 122.0 122.1 "17 July 2010". London: The Official Charts Company. 12 July 2010. Retrieved 14 May 2011. ↑ ""Renegades" stats". chartstats.com. Retrieved 19 July 2010. ↑ "Dean Deavall audio interview". wordgetsround.net. Retrieved 11 February 2011. ↑ "Feeder "Renegades" review". clashmusic.com. Retrieved 19 July 2010. ↑ "Feeder "Renegades" review". contactmusic.com. Retrieved 19 July 2010. ↑ "Feeder "Renegades" review". musicOMH.com. Retrieved 19 July 2010. ↑ "Feeder "Renegades" review". BBC.co.uk. Retrieved 19 July 2010. ↑ "LUNASEAOFFICIAL: 本日、INORANがFEEDERのLiveに緊急参戦!! 現在、Ustreamにて配信中!! まもなく登場!! (in Japanese)". Luna Sea Last.fm. Retrieved 21 September 2010. ↑ "Musical therapy". The University Observer. Retrieved 11 February 2011. ↑ 131.0 131.1 131.2 131.3 131.4 131.5 131.6 131.7 "Feeder Facebook page". Feederweb. Retrieved 11 February 2011. ↑ "Feeder Still Hungry". Heineken Music. Retrieved 11 February 2011. ↑ "Feeder release Japan aid single". The Sun. Retrieved 28 February 2011. ↑ "drumstars - Images - Damon Wilson". drumstars.co.uk. Retrieved 11 February 2011. ↑ "Feeder - 'Borders' - The New Single / Coming Soon". Feeder YouTube channel. Retrieved 7 December 2011. ↑ "Feeder - Borders". FeederVevo. Retrieved 19 January 2012. ↑ "Feeder to release new single 'Idaho'". music-news.com. Retrieved 15 July 2012. ↑ "Still going after all this time: British rockers Feeder stronger after 15 years, eight albums and countless tours". mancunianmatters.co.uk. Retrieved 31 March 2013. ↑ "Handwritten note on Facebook". Retrieved 5 June 2014. ↑ "Kerrang (1215): We Can Write Great Pop Songs!". feederscrapbook.co.uk. 21 June 2008. Retrieved 10 September 2008. ↑ "Interview: Feeder". The Tab. Retrieved 11 February 2011. ↑ By collating together the chart information in the 19th and final edition of British Hit Singles & Albums (Roberts, David (2006). British Hit Singles and Albums 19th Edition. Guinness. ISBN 1-904994-10-5), along with all 2006's weekly singles and albums charts, Feeder move from below the 2005 Top 500 listing to rank at #457 in 2006. ↑ "Hard Rock Cafe Cardiff Closes its Doors". Wales Online. Retrieved 1 March 2012. ↑ "Guitar has star spot at HardRock Cafe". Wales Online. Retrieved 1 March 2012. ↑ Laing, Rob (2012). Total Guitar - Come Back Around. Future plc. pp. 56–60. 40x40px Wikimedia Commons has media related to Feeder.